Brewing with the KitchenAid siphon coffee brewer. Assemble and prepare the siphon coffee brewer for brewing following your use and care guide. Add coffee grounds. Add fresh, filtered water. Be sure to not overfill it. Place the carafe on the base and the brew unit on the carafe with the handle either to the right or left of the carafe handle. Align the top handle with the lower handle, and lock. The dual-lock system magnetically locks the brewer unit into place. Press down on the on/off switch to begin brewing. During the brewing cycle, the switch will automatically turn off and allow the coffee to finish pouring into the carafe before serving. When finished, remove the brew unit from the carafe and place it back into the stand. The amount of brewed coffee may be slightly less than the water input; this is normal. Remove the lid and place it on the carafe, turning it to lock it into place. Do not reheat the coffee. For best results, drink coffee within 30 minutes of brewing. 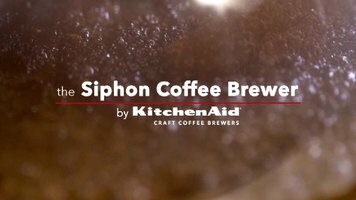 The KitchenAid siphon coffee brewer doesn't just make great, rich coffee; it brews with a dramatic, siphoning process. And it's easy to use! Check out this video to learn how. Love siphon coffee but loathe the complicated process? With the KitchenAid siphon coffee brewer, you can make the perfect, velvety cup of craft coffee with a single flip of a switch. 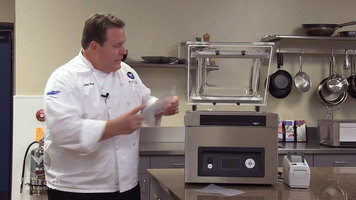 Vacuum pack your fresh or frozen foods with this Vollrath VPP16 in-chamber vacuum pack machine! Coming with an abundance of top-of-the-line, special features, this unit has everything you need to pack delicate, bulky, or hard products. If you want a juicer that can handle anything you throw at it, you need the Robot Coupe J80 Ultra automatic juicer! This video shows how easy it is to use whether you're juicing apples and grapefruits or carrots and cucumbers.